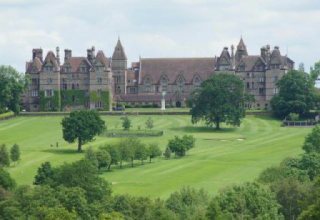 Denstone College is a day and boarding co-educational independent school set in beautiful grounds in rural Staffordshire. The college, founded in 1896, combines traditional buildings, with modern classrooms and technology. Denstone College offers a number of meal choices and can cater for most dietary requirements with prior notice (taken at time of booking). There is also a snack shop onsite selling sweets, drinks and savoury snacks. For residential students, accommodation is provided in comfortable bedrooms, either single or twin bedrooms of similarly aged students. Staff remain on site 24hrs per day to ensure student well being and safety. Facilities available include a common room with television/ dvd player as well as spacious grounds for relaxation in the evening and at break times. There is an excellent provision of sports facilities, including a climbing wall and swimming pool. Free WIFI is available. The nearest mainline stations are Stafford, Derby, Stoke on Trent and a branch line at Uttoxeter. From the M1: Leave the motorway at Junction 24. Take A453 towards Nottingham (S) and then follow A50 towards Stoke. At Uttoxeter, take the B5030, the 5031 to Denstone. From the A1M: Leave the motorway at Junction 35, merge with M18, then follow signs to M1 South towards Nottingham. From the M1: Leave the motorway at Junction 28, take the A38 towards Derby. Take the A516 following the A50 towards Stoke. At Uttoxeter, take the B5030, the 5031 to Denstone. The College is within one hour’s drive of three major airports; Manchester, East Midlands and Birmingham.